Wake up to the sound of the ocean in this beachside family sanctuary of peace and tranquillity nestled in the sand dunes of Currimundi Beach amid lush tropical surrounds. Superbly renovated and spacious beach house that sleeps 10 comfortably.It will be hard to resist the temptation to forget the unpacking and instead grab a cold drink, head straight to your expansive timber deck and find your favourite spot. Enjoy the rumble of the ocean and the cool sea breezes all amidst the lush tropical surrounds. The lawn leads directly to the white sand of the beautiful pristine stretch of Currimundi Beach. Enjoy the vista of the Coral Sea surf lapping the shore and feel the sand between your toes. Now you are truly on holiday!The relaxing lounging and dining areas all flow out to the inviting garden deck where you will surely be enjoying family dinners and drinks around the 12 seat banquet table complete with glorious rainforest backdrop. This level has 4 bedrooms with enough room to accommodate eight guests. The bedding configuration is 2 x Queen Bedrooms and 2 bedrooms featuring twin beds in each. The main bathroom and separate toilet also services this area. Downstairs provides a completely separate lounge room and 8 seater dining area. This zone is complete with a spacious bedroom (2 x single beds) and a second bathroom and toilet, which provides a privacy solution or a perfect teenage retreat. The laundry is complete with a washing machine and dryer plus a full size clothesline in the garage. This superbly renovated beach house caters for all, from the large extended family to the executive couple wanting the luxury of privacy and space. The hub of the house is located in the upstairs level, where the entertainers kitchen comes complete with quality appliances including dishwasher, microwave and a large fridge freezer.There is also a second fridge in the garage for extra stocks.Each of the two lounge areas has a full size LCD TV and a CD, radio and DVD player. They also feature comfy lounges to sink into and enjoy the downtime with a movie or a good book. This beautifully furnished property is decorated with an array of original artworks and with its warm, welcoming timber finishes creates your intimate beach home away from home. If you can tear yourself away from this beautiful spot, Caloundra CBD is only 5 km away and Mooloolaba is only a 20 minute drive. There are many world class attractions including Australia Zoo, Underwater World, the beautiful Sunshine Coast Hinterland, day trips to Fraser Island and so much more, all for your enjoyment. 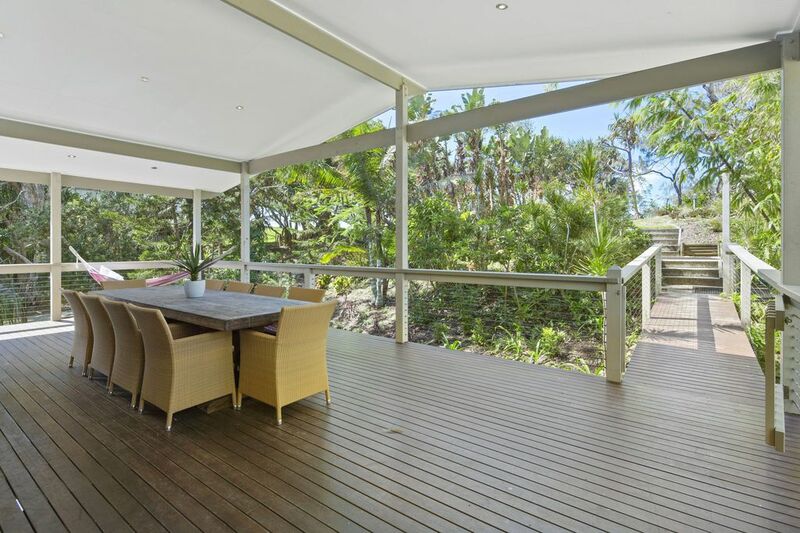 Whether you are looking for a peaceful holiday to simply laze the days away on the beach, or a more active holiday enjoying all the sights and delights of this glorious part of the Sunshine Coast, the Beach House Currimundi is your perfect choice. Linen is included in your stay. This home is self catering. A $1,000 security deposit is applicable to all stays. Very nice house. Spacious, well equipped, excellent position. We enjoyed our time in this house and in Currimundi. We will definitely be back. Unfortunately, it was very hot and we did find the nights unbearable with no aircon. The ceiling fans are of excellent quality but were not enough at this time of year. Excellent for a family holiday! Everything went smoothly and we had an great time. The agents were helpful and accessible. If you're wanting a house to cater for large groups and direct beach access then this is it.